Happy Valentine Bow in red satin ribbon that is layered on top of a white grosgrain ribbon. 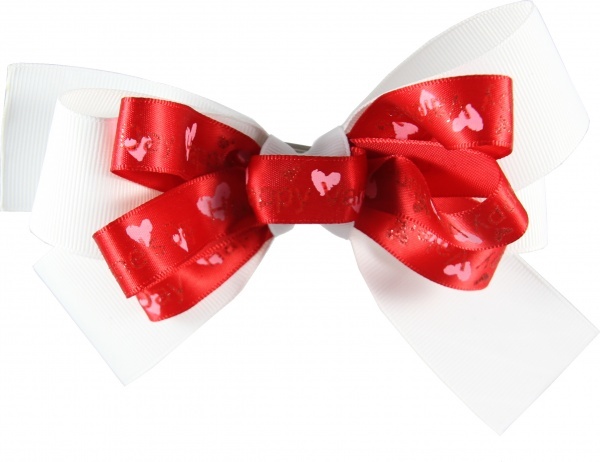 It has small pink and red hearts scattered on the red satin ribbon and glitter on top of the words "Happy Valentine's Day" and on the red hearts. You are getting 58" of ribbon, see the triple loops on the red bow. This is a perfect way for you to express your love on Valentine's Day.